A durable, heavy duty automatic drop seal featuring a wrap-around outer gasket with an additional internal gasket designed for superior acoustic performance. The seal features a parallel drop mechanism. It is spring- loaded to lift clear of the floor as soon as the door is opened by a few millimetres. Die cast end plates are available in a metallic finish for premium aesthetics. finishes Silver anodised aluminium, grey silicone rubber gasket. 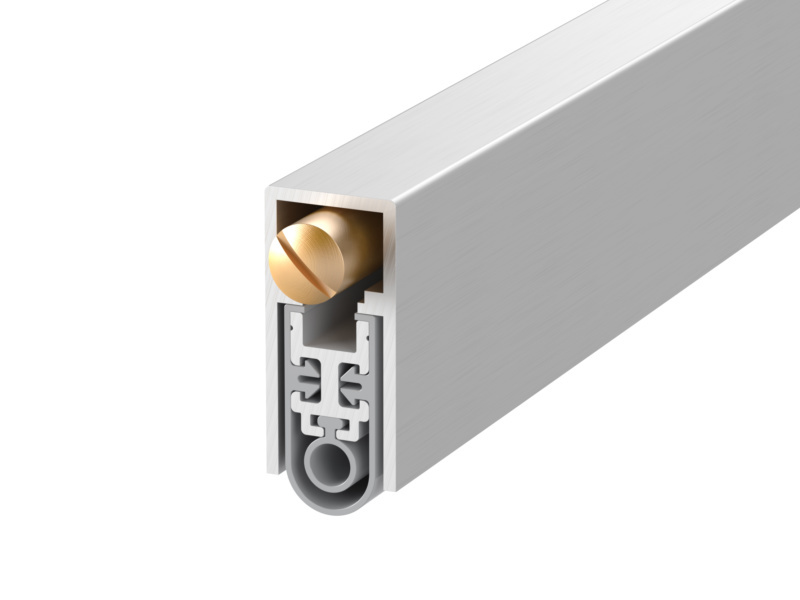 Die case end plates in square + radiused versions are available in a metallic finish. The non-button end cap is designed blank, creating an engineered smooth aesthetic. Standard length 335mm, 435mm, 535mm, 635mm, 735mm, 835mm, 935mm, 1035mm, 1135mm + 1235mm. Note: Other lengths can be cut back to the next size down. The 535mm can be cut back to 495mm. The 335mm can be cut back to 255mm.